LAS VEGAS, Jan. 10, 2019 /PRNewswire/ — On January 8, 2019, CES 2019 exhibition opened on schedule. As the global elite in the household appliance industry, SKYWORTH has presented many advanced new products and technologies during CES and became a protagonist. 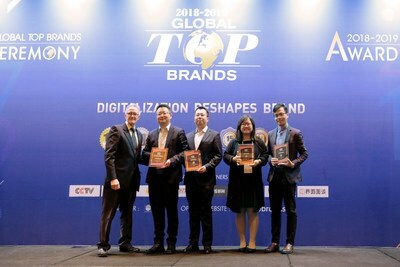 At CES 2019, SKYWORTH has been awarded 2018-2019 Global CE Brands TOP 50, 2018-2019 TOP 10 CE Brands, and 2018-2019 Global TV Brands TOP 10. SKYWORTH has earned recognition for its outstanding performance in the field of household appliances. SKYWORTH has also received 1 product award, the AI Smart Dual Ecosystem TV Experience Gold Award for 65S9A/XA9000. It supports both Google Assistant and Amazon Alexa, truly becoming the control center of the smart home. With a powerful PQ processor built-in, the TV can display the best image and create an extraordinary experience for audience. Besides 65S9A/XA9000, SKYWORTH has brought the latest products and technologies to CES, including a 277-inch super narrow bezel TV wall, 8K OLED TV, 82” Flush Mount TV, 65″ Quasi-pixel Backlight TV, etc. This exhibition also has a super TV showroom. The 77-inch OLED TV features Dolby Vision HDR imaging technology and is equipped with a 7.1.4 Dolby Atmos-enabled home theater system, delivering a spectacular and immersive experience. A smart room is also set up to highlight the forefront of AI development, as the TV can interconnect with all kinds of household appliances. SKYWORTH has built partnerships with Google, Amazon, and other technology giants to establish the intelligent product ecosystem. Based on the global strategy of “Open, Share, Win-win”, SKYWORTH will continue to focus on AI TV manufacturing to provide AIoT big screen intelligent solutions and the best products for their global consumers in the future.